Urdu is the national language of Pakistan. It is also widely spoken in India and people of sub-continent settled abroad use this language around the world. Many Urdu newspapers, magazines, journals, digests and periodicals published from Pakistan, India, UAE, Saudi Arabia, Europe, America and other countries as well. In the past, people only can read these newspapers' in print form but with the advancement of technology in last decade, now it is possible to read many popular newspapers online on your desktop or laptop computer without facing any delay or paying any direct price for it. 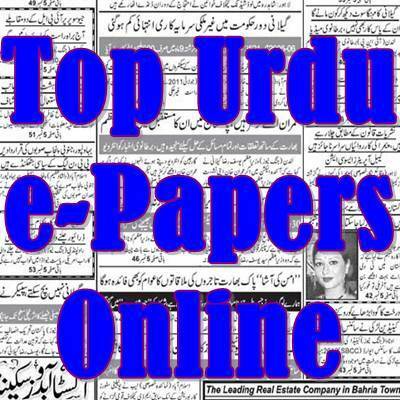 Though there are too many printed and/or online Urdu Newspapers but here are only six Most Popular Urdu Newspapers and Magazines which are also available online. Only websites which are in the form of e-Paper of newspapers are selected, Urdu blogs and Urdu News websites are not listed here. Daily Jang is the most popular Urdu newspaper. It is published from 3 cities of Pakistan; Lahore, Rawalpindi and Karachi. ePaper of all three versions are available on its website. Mir Khalil-ur-Rehman is the founder of this newspaper. Jang Group also published English newspaper "The News", Weekly "Akhbar-e-Jahan anmd many other daily and weekly newspapers. Jang Group also owns Geo TV Network. According to Alexa, it is 15th most popular website in Pakistan and 1684th most popular website worldwide. Daily Express is the 2nd most popular Daily Urdu Newspaper. You can read its latest ePaper on www.express.com.pk/epaper It is published from 11 different cities of Pakistan. Its Alexa ranking is 17 in Pakistan and 2232 in the world. You can not only read today's newspaper but can also explore previous issues with the click of your mouse. Nawa-i-Waqt also publishes its ePaper. Its Alexa ranking in Pakistan is 190. Nawaiwaqt Group of Newspapers owns Daily Nation, Weekly Family Magazine, Weekly Nida-i-Millat, Monthly Phool and Waqt News TV Channel. Chief Editor Zia Shahid's Roznama Khabrain is also a popular daily newspaper. It is published from 8 cities of Pakistan; Lahore, Islamabad, Multan, Karachi, Peshawar, Hyderabad, Sukhar and Muzaffarabad (AJK). Website of Khabrain is included in Alexa's Top 500 Websites in Pakistan. Akhbar-e-Jahan is largest circulated weekly newspaper in Pakistan. It is being published from last 46 years. It is also one of Top-500 Websites in Pakistan. On its website, you can read latest and old editions of Akhbar e Jahan online. Family Magazine is also a very popular Urdu magazine in Pakistan and internationally. You can read current and old archived editions of Family Magazine on its website. Given Alexa ranking is as on 20 November, 2012.